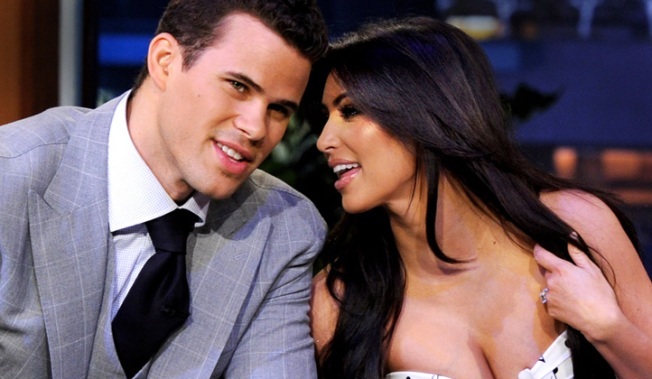 Kim's lawyer says Kris' "personal feelings and maybe some media drive is keeping this case alive"
Kris Humphries and Kim Kardashian in better days. Kim Kardashian's attorney told a judge Friday that the reality star wants her divorce from Kris Humphries to move forward but that the case has been slowed by the NBA player's hurt feelings and his desire for an annulment. Humphries' attorneys said they needed more time to gather information to decide whether to pursue allegations that the couple's 72-day marriage was a fraud. Proving the allegations would likely require a trial, which Kardashian's attorney Laura Wasser said could prove costly to her estranged husband. The couple was married last summer in a lavish, star-studded and televised ceremony, but Kardashian filed for divorce on Oct. 31. Humphries responded a month later asking for an annulment, claiming the couple's nuptials were based on a fraud, but not laying out specific evidence. "I feel that (Humphries') personal feelings and maybe some media drive is keeping this case alive," Wasser said. She said the couple is eligible for a divorce since it has been more than six months since Kardashian filed her petition. "Certainly, they've been separated longer than they've been married," Wasser said. She said if the case goes to trial and Kardashian wins, she will ask that Humphries pay her hefty legal fees. Currently, Kardashian wants each side to pay their own fees. The comments came during a routine hearing Friday in which a judge allowed Humphries' Minnesota attorney, Lee Hutton, to take part in the case. Humphries' Los Angeles-based attorney Marshall Waller said they had to wait for the motion to be approved but that he expects to seek key information and the depositions of essential witnesses in the next few weeks. Superior Court Judge Stephen Moloney told both sides to return to court on Aug. 15 for a status hearing. Neither Kardashian nor Humphries attended Friday's proceedings. Kardashian is the star of the E! Entertainment Television series "Keeping Up with the Kardashians," which was E! Entertainment Television's top-rated show, averaging more than three million viewers in its sixth season. Humphries, a power forward who has played with the New Jersey Nets, is an unrestricted free agent.